We are specialized in manufacturing and exporting "STAPUPA" Cellulose Thimbles, which are used for monitoring and measuring air pollution and also for determination of particle matter. These are manufactured from 100% cotton cellulose. It is used for collecting the dust in the stack gases. Thimbles of various sizes is being used by environmental laboratories to test air pollution caused by chimneys of coal fire, thermal power stations or diesel generating sets, etc. We are among the illustrious names in the industry, making available Cellulose Extraction Thimbles made up with pure cellulose to our priceless customers. The offered thimbles are manufactured using high grade cellulose obtained from reputed vendors. Characterized by high mechanical strength and rigid construction, these thimbles deliver optimal performance to the customers. Application : Stack monitering, pollution measurement labs,Air monitoring. Our vast industry expertise has led us to offer Extraction Thimbles (Made up with pure cellulose) to our revered customers. Manufactured using pure cellulose, these thimbles are highly regarded for their high strength and outstanding retention properties. Owing to their dimensional accuracy, these thimbles can fit the extractors perfectly well. 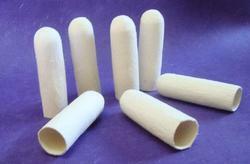 Looking for Cellulose Extraction Thimbles ?